“Rebound” is a celebration of the intelligence and tenacity of the wolf. 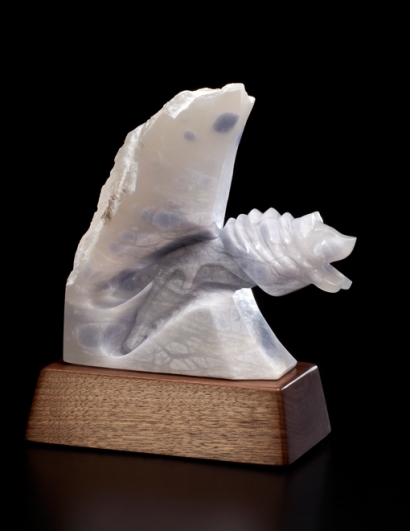 Last year my sculptor friend, Kanae Fukuhara, suggested I create a stone sculpture of a wolf. I began my research knowing very little about wolves. I have learned much about their historic persecution and re-introduction into Yellowstone National Park. They are very social animals with a complex pack hierarchy. Several people compare wolves to people as apex predators with strong community bonds. They offer this as a reason for the competition and hatred of some people for all wolves. Food for thought. I believe wolves are necessary members in a stable ecosystem. They keep deer and elk populations down to insure against over-grazing. All plant and animal species interconnect in an ecosystem. Scientific research proves that wolves play a most significant role in maintaining balance in a healthy environment. Wolves have extended their range in the west outside the boundaries of protected areas, and people are once again shooting them on sight. They blame them for livestock losses which they cannot prove to be the fault of wolves. I am hoping people can overcome their hatred and adjust their ranching practices to incorporate a greater human presence on their rangeland. This reorganization might encourage wolves to avoid livestock, and solve the problem. We need to learn how to share the planet with all living creatures now . . .